Ashima Research manages one of the Mars Science Laboratory (MSL) weather data sources that our site uses to post our daily Mars weather reports. Ashima also manages a blog about this weather data. When the primary Remote Environmental Monitoring Station (REMS) weather data source began to publish what seemed like a series of ludicrous, child-like mistakes, in addition to contacting JPL's public relations man, Guy Webster, I also wrote several entries for the Ashima blog pointing out what REMS and Ashima mistakes were. Every single one of them was deleted by Ashima, with most deleted almost immediately. There was no attempt to address any of the concerns, including Ashima's obviously wrong sunrise and sunset times. The question then arose as to whether Ashima had a vested interest in keeping important facts about Mars from being discussed in the public domain. In pursuing the truth pertaining to the above concern, the first question was Who are these people? The answer is that they are a team composed of scientists at Ashima Research in Pasadena, California, the John Hopkins University Applied Physics Laboratory in Maryland, the Jet Propulsion Laboratory in Pasadena, and at the Massachusetts Institute of Technology Department of Earth, Atmospheric, and Planetary Sciences in Cambridge, Massachusetts. Now, while this criticism of their approach to science and their credibility is being posted on the DavidARoffman.Com web site because my son and I have pursued the issue of atmospheric pressure on Mars for over three years, the criticism in this article is solely that of Barry S. Roffman. David, in pursuit of his own PhD in physics, is simply too busy with his own studies in solid state physics to have the time required for the issues explored in this article although, after a lot of nagging on my part, he took the time out to do the sunrise sunset math). Therefore, any concerns about what you are about to read should be addressed to me alone at BarrySRoffman@Gmail.Com. This article is also posed on my MarsCorrect site. The issue of stuck pressures and instrument reliability is highlighted in limited fashion on Figure 3 below, and in a greatly expanded manner in Annex C of our Report. As it shows, while temperatures and winds often varied greatly, for long periods of time there were no changes in Martian air pressure. 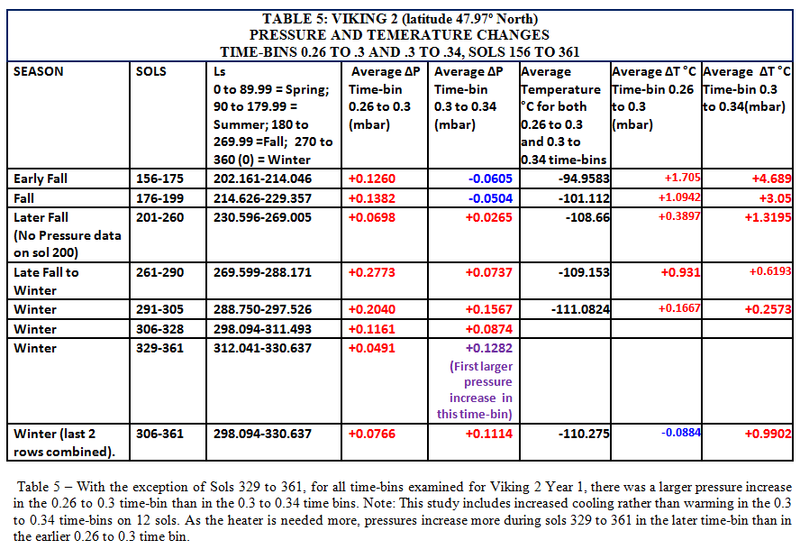 Since the Ashima/MIT CGM places an enormous emphasis on what was happening at Viking 2 on Ls 135, let's check the facts for it as taken from Professor Tillman's Viking Project site. Click HERE for Year 2. Figure 3 shows what was found for each of two Martian years between Ls 135.001 and Ls 135.987 (each period involving three sols). For the second Martian year, every single pressure was exactly 7.47 mbar. During this period the temperatures varied from -12.28° F (-24.6° C) to -117.71° F (-83.17° C). Winds reached 6.7 m/s (about 15 MPH). The wind direction varied from almost every heading, and yet there was no variation whatsoever in the reported pressure. In fact, the situation is worse than this. 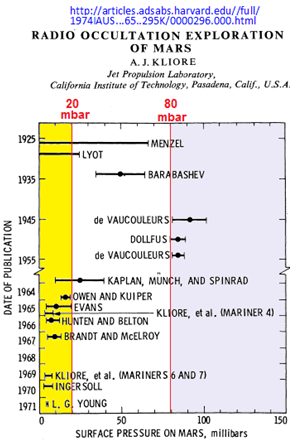 As is highlighted color on pages C-26 to C-31 in Annex C of our Report, the period of time during which pressure was stuck at exactly 7.47 mbar began at Viking 2's Sol 700.5 (at Ls 133.079°) and it extended until Sol 706.46 at Ls 136.068°. There were 150 hours worth of straight stuck pressures reported. This seems a bit too hard to believe, and indeed it does not at all match many other days when there was an inverse relationship between temperature and pressure, as is shown for MSL on its first weather report, shown on Figure 4. 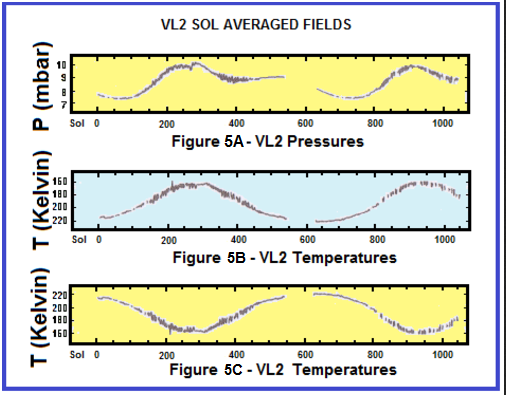 We will next focus (with Figure 7) on how pressure varied for Viking 1 at Ls 270° and for the period between Ls 269.282° until Ls 287.862°, which specific emphasis in the pressure changes between the 0.26 to 0.3 time bins and the 0.3 to 0.34 time bins each morning. Notice that one change during the 0.26 to 0.3 time bin (hour) at Ls 286.576° (sol 332.3) was a whopping 0.62 mbar (62 Pa), which is more than 10% of the 6.1 mbar average pressure at Mars Areoid. The change during this time bin for Ls 270.6° was 0.09 mbar (9 Pa). The average change for this time bin between Ls 269.282° until Ls 287.862° was an increase of 0.32568 mbar with no decreases in pressure, whereas the next hour (the 0.3 to 0.45 time bin) only had an average increase in pressure of 0.02967 mbar with 11 instances in pressure drop out of the 22 pressures listed. The Martian clock is shown to the right on Figure 7. The time at 0.3 each sol was equivalent to 7:30 AM on a 25-hour day), while 0.34 equates to 8:30 AM. It appears that at the 0.26 to 0.3 time bin heat was pumping into the transducer, whereas in the 0.3 to 0.34 time bin that pretty much stopped. These cyclic pressure increases are detailed in excruciating detail in the Annexes of our report, HIGHER THAN ADVERTISED MARTIAN AIR PRESSURE. They constitute important proof that the pressures transducers were not measuring ambient pressures on Mars. It is the third statement above that really points to the problem. 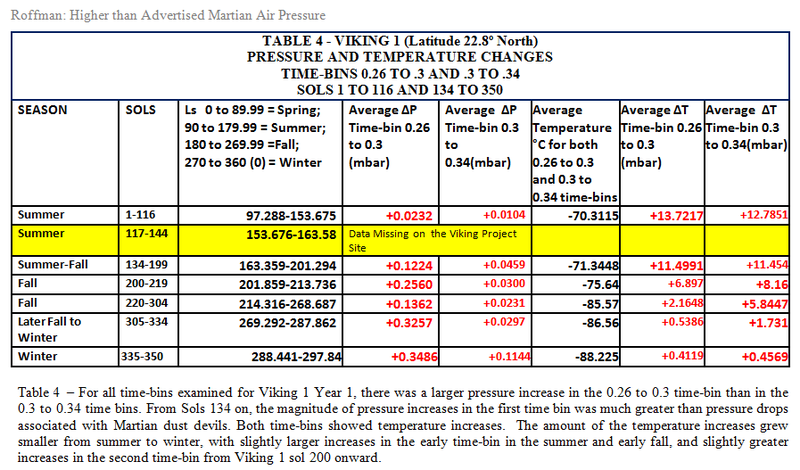 Just how accurate are the Viking Pressure Curves? This is the Achilles Heel of all CGMs. It is what my son and I spend almost 500 pages attacking in our Report. Here I will diverge from my son's approach to science. David thinks that the mistakes made by the REMS Team and Ashima Research on their public relations web sites are trivial, and that all that matters is what they publish in peer-reviewed scientific literature like the article that I have been reviewing here. I, however, believe that everything published or said by scientists about their studies is significant. I think this way because I wrote the war plans for six U.S. admirals between 2003 and 2007 and I know that if I publish wrong guidance it could cause some of our people to get killed. The same is true with respect to Martian weather. A dust devil the size of a large tornado on Earth would probably not be fatal if the average pressure is 6.1 mbar, but it probably would be fatal to astronauts if the real pressure were more like the 742 to 747 hPA that REMS published from September 1, 2012 to September 5, 2012. (2) Dr. John Brandenburg. If you read the link just provided, you'll notice at the end a reference to his latest scientific book: “Life and Death on Mars: The New Mars Synthesis.” It says the book deals with the evidence that a large asteroid impact on Mars late in its geologic history may have collapsed a persistent greenhouse regime on that planet, and that such a climatic collapse may have triggered a mass extinction of life there." This is a good example of how the fear factor that dominates science makes it tough for scientists to consistently write what they really believe. In fact, as we discuss HERE, in addition to an asteroid impact, on page 180 of his book, he goes far beyond his paper which was published by the 42nd Lunar and Planetary Science Conference in 2011. There his argument was for a natural nuclear explosion on Mars similar to one at Okla in Gabon, Africa. But in his book he espouses the idea of an ancient Martian nuclear air burst carried out with great malice by a great (but not compasionate) Intelligence. Although he and my son were speakers at the International Mars Society in Dayton, Ohio in 2010, we did not come to really know him until 2011. My son didn't take away the idea that it was career enhancing to fight the Martian air pressure debate. After seeing how Mars affected Brandenburg's career, David switched his career goal to experimental physics. He doesn't believe that our Government will allow the truth to be known. Of course, if Brandenburg is correct, then we have a motive (other than incompetence) for NASA/JPL keeping the truth from us, and for its feeding our scientists bad data that never matches up with a GCM, no matter how clever it is. Brandenburg has staked out a hard position to support. His book, however, was put out too fast after the press (Fox News) covered his paper on the natural explosion. It is in serious need of a major edit, and until that happens, he has little chance to be taken seriously.